The danger of dengue after a tough year is finally showing signs of easing, but experts warn that the oncoming northeast monsoon may reverse the positive trend, if we are not careful. A 70 percent decrease has been reported in dengue cases when compared with the same period last year, and only 313 cases have been reported so far for the month of October. 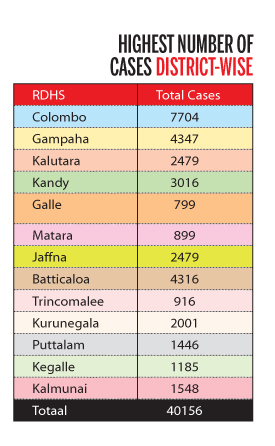 The highest number of dengue cases – 7,654 – was reported from the Colombo district, while the second highest number – 4,308 – was reported from the Gampaha district. The third highest number – 4,300 – was reported in the Batticaloa district. 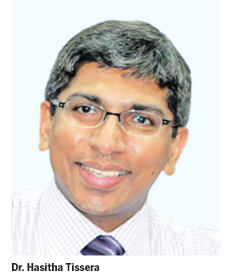 National Dengue Control Unit (NDCU) Director Dr. Hasitha Tissera said there could be an increase in the coming weeks considering prevailing weather conditions. He said the Northern and Eastern Provinces, and Jaffna, Trincomalee and Batticaloa in particular, would be the most vulnerable areas in the country. A total of 39,793 dengue cases and 43 deaths have been reported from all parts of the country until October 12 this year. 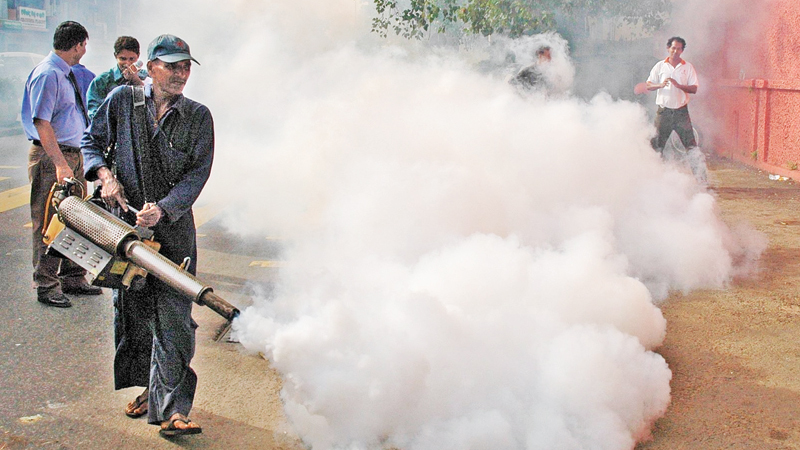 The Colombo Municipal Council (CMC) reported 1,945 dengue cases during the same period. 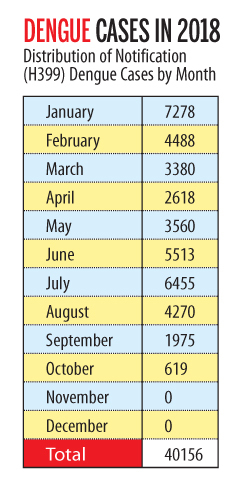 The other parts of the Colombo district recorded 5,709 dengue cases. The number of dengue cases reported in the Western Province is 14, 421. The districts where most cases were reported were Colombo, Gampaha, Kalutara, Kandy, Galle, Matara, Jaffna, Batticaloa, Trincomalee, Kurunegala, Puttalam, Kegalle and Kalmunai. Dr Tissera said that dengue was mostly an urban disease. “Mosquitoes breed in manmade containers, in small collections of water, and the possibility is very high in urban settings,” he said. He said dengue was a viral disease which spread easily. The main factors that influence the fast spreading of dengue are susceptible people and the abundance of mosquitoes, as it was a viral disease. External factors like weather conditions add to it and can lead to the breeding of more dengue mosquitoes. Dr. Tissera called the dengue epidemic a cyclical phenomenon and added that uninfected mosquitoes get infected by people who are diagnosed with dengue fever. And therefore the transmission continues. “We have to break this phenomenon at different levels. We are now conscious about the ways in which we can prevent transmission,” he said. Dr. Tissera noted that they watch for specific areas of the outbreak of the disease, as cases are more easily identified when there is a cluster of patients caused by local transmission of the virus. He added that when a cluster of patients is admitted or reported from one area, PHIs are immediately deployed to look into it and necessary measures would be taken. The NDCU employed 1,300 field health workers last year at a national level as a part of source reduction campaign to support and help the public to remove water-collecting and mosquito-breeding points. Dr. Tissera said the waste segregation campaign conducted by the Local Government and Provincial Councils Ministry greatly facilitated their dengue prevention campaign. The Presidential Task Force on the Prevention of Dengue (PTF) together with the NDCU initiated a process to supervise all construction sites to ensure they function under strict regulations and to ensure that no mosquito breeding sites are formed. The sites were provided with non-toxic lavisides as a temporary measure to get rid of mosquitoes. “All these years they were fogging with the involvement of the PTF and the Health Ministry. Now they are given lavisides instead of fogging. Only adult mosquitoes get killed by fogging. Lavisides destroy all mosquitoes,” said Dr Tissera. The other campaign is focused on schoolchildren. The Health Ministry’s Epidemiology Unit has identified that schoolchildren have a higher chance of getting infected. And the NDCU has taken measures to control mosquito breeding places in schools with the help of the Education Ministry. “We have allocated specific times to check places of water retention and parents are requested to come and clean the school premises,” Dr. Tissera said. School authorities have gradually paid more attention to mosquito breeding places and segregated garbage bags have been given to primary schoolchildren and they are planning to expand the project further, he said. The National Mosquito Control Week started on September 26 and ended on October 2, covering the entire island and was organised by the National Dengue Control Unit and the Presidential Task, with the intention of preventing and controlling a potential dengue epidemic with the onset of the northeast monsoon. The programme was implemented in on all days in 50 high-risk MOH divisions and on five days in 125 dengue endemic MOH divisions, while inspection of school and construction sites was also conducted. Dr. Tissera said that nationally, 175 risk areas were identified. “For this purpose, 6,000 persons including members of Tri-Forces, police and civil defence force, formed into groups and inspected 350,037 premises. He said they went from door to door educating people and ensuring that they would keep their properties mosquito-free and local government bodies also supported the campaign. He emphasised that these places need to be frequently checked as the dengue cases can go up in the next few months due to the prevailing rains. The total potential breeding sites in the North Western Province, Northern Province and Central Province was high. The total percentage of premises with mosquito larvae was 2.79 percent, while the Sabaragamuwa, Uva, Central, South and North Western Provinces recorded a higher value. Percentage of potential residential breeding sites was 25 percent, while a larvae percentage of 2.5 was identified. The potential breeding sites within school premises was 60 percent, while the presence of larvae was over 14 percent. Potential breeding sites in construction premises were 64 percent and the presence with larvae was 10 percent. Dr. Tissera said the current high-risk situation in schools and construction sites need immediate remedial action. He said people are very well aware of how dengue is spread and the need for control of mosquito-breeding sites, but they just need to be reminded from time to time.